Man, oh, man, is this month ever going to end? So, let’s see, what’s happening in this corner of the world? Well, this past weekend I learned how to tie different types of knots. Not sure in what instance I’ll ever get to employ that knowledge, but I guess it never hurts to know these sorts of things. I also went to see Dennis, my tattoo artist about some work I want to have done. Unfortunately he cannot tattoo a sparkling shine to my windows throughout the house. (It’s getting to be that time of the year). Actually, no, I’m adding on to my charm bracelet arm band and I have an appointment this coming Friday to have it done. I’ll be sure to post pictures. From the It’s Kind Of Late To Bring This Up Now But I Just Want To Make A Point Department: I did not watch the Oscars this past Sunday night for the simple reason they were on ABC and since January 13 of this year, as you know (ad nauseum) since One Life To Live ended, we don’t watch ABC. But I was super glad to learn that The Artist won for Best Picture. I’m so waiting for it to come out on DVD. I see both my computers are in need of a back up this morning and one of them could really stand to be backed up….over…under the tires of my car. But that’s another story. I’m also wanting to kind of change up, slightly, the layout of this blog. And since this month is just dragging along I’ll have not one, but two more days to try to accomplish that task and hopefully can unveil it on March 1. The look may change some, I just can’t guarantee the same for the content. Speaking of March 1…it’s opening day to start making reservations for camping season. I’m getting my fingers warmed up for the marathon dialing and redialing. Let’s see how long it takes me to get through this year. Was it twenty minutes last year? I don’t remember. I know it wasn’t as bad as a few years ago when it took me two days. Now let me go see about “backing up” my computer. First there was fire, then the wheel and then the standard by which all else is measured, sliced bread. Liquid paper was a miracle, the Snuggie, an apparent quirky success. And in the evident and often frustrating onslaught of technological advances (and I do mean the computer and its myriad relations, not the light bulb or the wax roll phonograph…did you know they’re even reproducing the original Edison light bulb for fancy schmancy home lighting applications? )….man, I hate run on sentences. Let’s see…frustrating…advances…right… onslaught of technological advances, it’s easier than ever to get out an email or look up who starred in what movie. Especially if you have a pair of Beauty and the Geek….jeans. Inventors Erik de Nijs and Tim Smit from the Dutch design company Nieuwe Heren have developed a pair of jeans with a fully functional keyboard built in, along with a mouse housed in the back pocket and there is even a set of speakers. A kind of new twist on the term “laptop”. If it was a concern of yours, the weight difference in these jeans compared to regular non-technologically integrated denims is minimal, just slightly heavier, according to de Nijs. 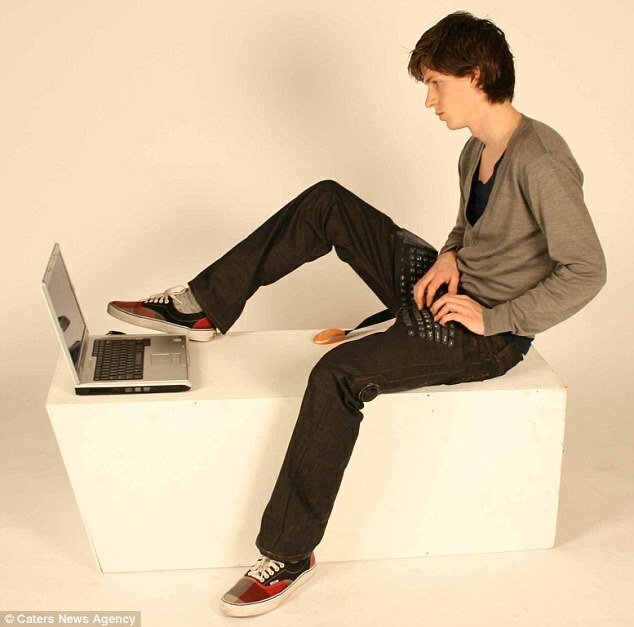 Along with Smit, they fashioned these jeans with the mind that one could still log into their computer without having to sit in a closed environment. The jeans, which will tether to your computer via a wireless USB connection, are expected to sell for approximately £250, which translates to about $392.50. 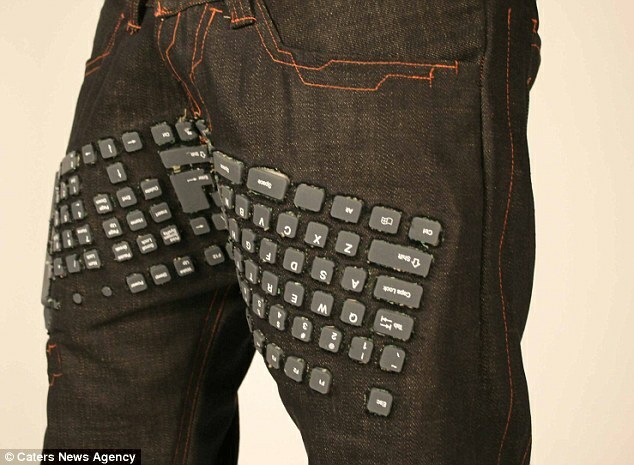 Okay, let’s see, a keyboard on your pants to use… on a laptop, which already has a keyboard. Besides the novel idea behind the keyboard jeans, there are already instruments one can use to not have that closed in feeling; well, for one, the laptop, the iPad, most smartphones, like my new Droid Razr Maxx, (just as an example) and if all else fails, an iPod touch can work in a pinch. And all for around the same price, give or take. And then, there’s the concern of laundering your stylin’ new laptop. And what if you spill your beer, will they short circuit? How about simply looking foolish? And how durable is that space bar expected to be? Something tells me it’ll get quite a workout, if you get my drift. Honest, I was just typing, officer! You know how I hate to poo-poo on anyone’s parade, after all, I did fall for those Eggies a while back, to the tune of 2 dozen, but how about a rubbery roll-up blue tooth-connected keyboard like I got as a gift this past Christmas. It can be used with any wireless device such as a smartphone and if you find yourself in the immediate need of sending an email, you can do so–a little more encumbered than a normal keyboard, but less restrictive than the one on your phone. Alack and alas, you may have to wait a while longer to get your very own pair of Beauty and the Geeks because the Dutch duo doesn’t have enough capital to mass produce the jeans. I think the handwriting has been on the wall for a long time that something like this could have happened. It’s the oft-times unnecessary governmental involvement in our everyday lives. I always harken back to the smoking ban…wait, I’ll go back one step further–the runny egg debacle, when it was “unlawful” to order an egg with a runny yoke. Or how about the time I caused a ruckus in an Atlantic City restaurant when I couldn’t get my burger cooked the way I wanted it, as per the notation on the menu– *cooked to order*. I ended up bringing a way over due pregnant manager to tears arguing back and forth that well done, how they were cooking their burgers, was not to my liking and that I should be served something else from the menu for the price I was willing to pay for the burger and suggested they had better redesign their menu. Then there was the smoking ban which really got my goat. Not being a smoker it came as a surprise to most people how outraged I was. On the presumption I was a smoker, I took the stance of why should I be asked to leave my meal or my companion in a restaurant to go stand in the rain and the cold to have a cigarette if it bothered the table next to me. Why couldn’t THEY go outside and let me enjoy my cigarette? After all, I’m paying my hard earned money to be in there just as much as that non-smoking table. Then came the booster seat for kids up to the age of, what was it, 16? No, 8 or 9 or to a certain weight. And of course helmets for anyone who mounts a bicycle. Where was the intrusion going to stop? How soon before my home was invaded? Well, it wasn’t my home, but the home of a certain North Carolina family. The mother of a 4-year old pre-schooler received a note from the school that she would have to pay a fee of $1.25 for the lunch her daughter was given, to replace the lunch a state employee inspecting lunch boxes deemed unhealthy, that it did not meet the U.S. Department of Agriculture guidelines. The note explained that students who do not bring “healthy” lunches would be offered the missing portions, at a charge. According to the mother, who wishes to remain anonymous to protect her daughter against any backlash reported that the girl’s lunch that day consisted of a turkey and cheese sandwich, a banana, potato chips and apple juice. She also stated she never packs a vegetable because the girl is picky and probably wouldn’t eat them, but she watches her at home to make sure she eats them. Seems to me, that the turkey and the cheese covers the protein, the grain and the dairy even if it was on white bread, but it was whole wheat. The apple juice and the banana covers the two servings of vegetables or fruit. (The lunch has to include a fruit or a vegetable, but not both, says Jani Kozlowski, the fiscal and statutory policy manager for the Division of Child Development). It’s also stated that there is no clear restriction on additional items, like potato chips, the can be included in home-packed lunches. So, what did the school give her? Chicken nuggests, of which she ate three. I’m confused. The other morning on the TV news I heard that Atlantic City is on the verge of regaining its crown in world of gambling on the East Coast. Later that night, we heard a clip on another news program that Atlantic City is in an almost irreparable spiral downward. So, what is one to think? Considering we’ve got no money to gamble with anymore and when we have a few bucks we feel like being frivolous with, we head to the Sands in Pennsylvania. I guess we, like the rest of the population, got attracted by something shiny. Well, now, Atlantic City Casino Reinvestment Development Authority, in a bid of revitalization, is planning on making a big splash this summer with not only a new casino, the Revel, and new facades on the Boardwalk, but with the return of the Diving Horse on the Steel Pier. And, as one might imagine, the plan is being met with strong opposition from animal activists. Valerie Pringle, the equine protection specialist employed by the Humane Society of the United States has her concerns: It’s a misnomer to call it diving. That suggests that they willingly jumping. The platform slants, and they fall. 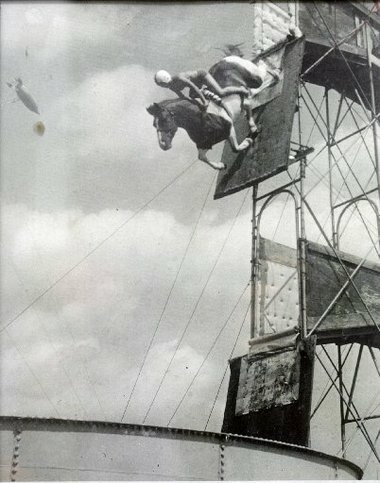 What kind of training is involved to get a horse to do something incredibly unnatural. You’re forcing a horse up a ramp. There’s no way the horses can turn around. And the Society says of the act, that it would be like advocating bear-baiting or dog-fighting. Threats against the new owner of the Steel Pier, Anthony Catanoso have also been made. One protestor even suggested having Catanoso dragged to the top of the platform, cattle prodded and dropped into the pool below. Retired horse trainer and rider, Billy Ditty, who is now retired and resides in Florida with his wife, Ruth, wishes he could come back up to New Jersey, to see if the people were doing it right. He says in the 16 years with the act he never saw an injury to a horse. One panicked when it hit the water and had to be led out and one was spooked by the flash of a camera bulb and the dive resulted in an injury to the rider. He and his wife also state that even back then animal activists protested. But, Catanoso means business and has hired a private consulting firm to handle the specifics including training and recruitment and the horses will be treated like gold. And Happy Valentine’s Day to all my readers! 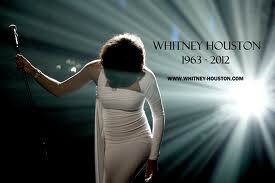 What shocking news we had this weekend, that Whitney Houston was found dead in her hotel room, the day before the Grammy Awards. Of course every news outlet was on it and playing detective, all trying to out-sleuth the other and solve the cause of death. Well, as of this morning, I understand the autopsy was completed and the only information the coroner’s office is reporting is there was no signs of foul play or trauma and complete results, pending toxicology reports to be concluded and could be released in 6 to 8 weeks. Meanwhile, I was listening also to a commentary on the habits of voters across the nation who dish out excuses for not casting their votes for many reasons including inconvenient times and a thought came to me. In this day and age with lots of travel for business or what have you combined with the fact that nowadays just about every move one makes is “watched”, and taking the proxy vote a step further, why can’t registered voters vote from remote locations? Voters could carry a credit card-like voter card, find a computer somewhere, (or a swipe thing-a-ma-jig) sign in with your info, cast your vote, and continue on with your Mai Tai. Just a thought. On the iPod front, you might be glad to know the entire music catalog was backed up. It took about 2 hours for the initial backup to an external storage device and that was repeated to back it up onto my laptop. The curious thing is, the album covers (the entire reason for all this) which were visible on the computer when the iPod was plugged into it, but not on the iPod itself, carried over in the backup. So, basically the task at hand is to remove each album from the iPod and replace from the backup files and the art work goes with it. Out of the 574 I’m transferring, I made it all the way through the O’s so far. I might be a lot further if that infernal iTunes would stop crashing on me. But it’s easier than loading disc by disc so I should just shut up and be satisfied. And onto Monday, full steam ahead! Remember all those news stories during the height of Christmas shopping season when total strangers were paying off peoples’ layaway purchases in stores? Heartwarming? Yes. I especially remember the story about the young boy who took his piggy bank money to his local department store and had lawaway clerks awash in tears. You hear those kinds of stories and you think it makes no other difference in your own life other than bringing a tear to your eye or touching your heart, assuming you have at least half a heart. I was talking to my aunt yesterday, catching up with what’s been happening since my father passed away and we covered everything in those twenty minutes from politics, to air travel, to the weather, to an unbelievable story of good humanitarianism. My aunt Lorraine, aka. the Southern Dudette, the Packrat of the South, and, of course, Sally Field, was out shopping and standing in line and struck up a conversation with a gentleman in line with her. She said they spoke for about twenty minutes about the topic of money and how everyone is cutting corners nowadays. I really don’t remember the specifics she mentioned, but that more or less covers it. He got checked out and left and she soon was on her way. As she crossed the parking lot she heard the man calling to her, telling her he had something he wanted to give her. Cautiously, as he approached him, he held out his hand and he dropped what he was holding into hers and told her it was something to help her out. When she got in her car, she uncrumpled what the stranger dropped into her hand and found it was a $100 dollar bill. I could hear her choking up as she told me the story. She said it renewed her faith in people. Okay, now it’s time for an update or two, to send you off on your weekend. SOPA: the bill to impose copyright infringement on just about everything on the internet….DEFEATED. JOHN GOODMAN: the guy who adopted his girlfriend as his daughter. Oof! What I didn’t know was that he’s the founder of the Polo Club Palm Beach who is facing manslaughter charges from a DUI accident in which it’s alleged he killed 23 year old Scott Wilson after driving his Bently into the young man’s car, knocking it into a river where the driver drowned is being SUED by his two teenage children against the adoption that would further divvy up their share of their more than $300 million trust fund. And then here’s one I just don’t buy: See this picture? A spokesperson, Maj. Gabrielle Chapin at Camp Pendleton said it was a naive mistake made by the Marines who believed the SS symbol was meant to represent Sniper Scouts. Really? They’re in the military and they don’t recognize one of the most notorious symbols of all time? Actually this is a call out to anybody who may have had the same trouble with their iPod Touch; I could use your advice or brainpower. The other day, I saw I had a system upgrade to my iPod, formerly a 4, to a IOS5. Of course, on the laptop not being the “home” computer where the iPod is registered warned me that my contents would be wiped out, so I waited until I would be on my big computer. Long story short (good luck on that one), after all the processes were complete I had some serious decided troubles with my unit. The first thing was, none of my apps were opening; they’d flash like they were going to spring into action but then if failed and went back to the desktop. No matter which app I tried to open, I had the same result. Needless to say, I was prostrate with frustration. By luck, Ariel attempted to remove one of them to reinstall and after he did that they all seemed to be A-Okay. Okay, fine. Then I couldn’t load my email, nor my Facebook and that was a completely different situation, but I’m sure it was precipitated by this system upgrade. I have since conquered that battle, but one last frontier remains unconquerable. There are certain albums on the iPod that have album art attached. Those same albums appear in the iTunes Library. Normally I keep the library cleaned out after a CD gets into the iPod to keep my computer from having too much going on. I only keep things that I otherwise downloaded or got from another source; things I don’t have ready access to should they have to be replaced and I don’t know how these other albums got in library. When the iPod is connected to the computer, however, I can see the artwork for ALL the albums, even though they don’t appear on the iPod. So, I’m going through all 574 albums, copying the artwork, then I will strip off the music and reinstall it. I’ve already tried copying it directly into the iPod from the “get info” option but that’s not working. Anybody have any other ideas before I embark on this stripping venture? I wouldn’t exactly call myself a rebel..well, maybe just a little, but I don’t like doing things that don’t seem to make sense. But when they want something, they don’t mess around. A while back, I got a letter in the mail announcing I’d be getting a survey, a census of a sort, sent anonymously to my address, for this, that and the other reason. Then I got a post card saying I should have received the survey. Well, I had already filled out the census the first time around and saw no need to do it again, plus on this one they wanted my name (and Ariel’s), our address, phone numbers, rank and serial numbers. How anonymous is that? We put it aside and ultimately received another letter saying they (the Government) had not yet received our form. Then I started getting faxes asking for the completion of the thing. Ariel called and found out it’s a legitimate and random thing that’s been happening pretty much since the Pilgrims stepped foot on Plymouth Rock. 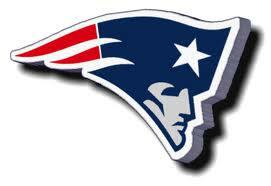 (There’s that name again…LET’S GO PATS!). Not only did I get another reminder letter yesterday, but a woman, equipt with a Governmental ID hooked around her neck and a stack of calling cards in her shirt pocket that had the notice on them that she was required to return again and again until she attained the necessary information came a-knockin’, nestling her open laptop to her bosom ready to question me at my front door. Well, that wasn’t going to happen. I told her the questionnaire was already sent. Had it been? I’ll never tell. I think that groundhog was right yesterday. Everything was fine in the beginning of the week, until that prognosticating little rodent saw his shadow. The temperatures were so nice and mild, I almost felt like strolling about in the all together, but I learned my lesson once about doing that in public. Besides, I live on busy street. But this morning my winter coat almost wasn’t enough coverage to get to the mailbox. Nice going, Phil! You’ve heard about John Goodman, haven’t you? No, not the star of the Roseanne Barr show, but the wealthy Floridian involved in a vehicular homicide case. Goodman is facing a wrongful death suit from when he ran a stop sign. Results from a sobriety test showed his blood-alcohol level was twice the legal limit that night when Scott Patrick Wilson was killed. However, in a mind-boggling turn, Goodman, who already has a trust set up for his two minor children, found a way to further protect his assets from going to the Wilson family should they win their civil case against Goodman in March. He adopted his 42 year old girlfriend as his daughter so he could legally give her a third of his trust. Goodman’s lawyer insists this move was NOT spurred on by the lawsuit. Smart? Scummy? The report from Gobbler’s Knob, Pennsylvania, after Punxsutawney Phil was roused from his slumber with this proclamation, looking out among the crowd awaiting his decision: Many shadows do I see, Six more weeks of winter it must be. You know what pisses me off the most about that? I don’t know if it’s recent, due to stupid political correctness or if it was this way all along, but the uppity news people on TV do their best to make a huge joke of it. Come on, people, it’s just a fun tradition. Get over it. Show of hands…how many of you remember when I was chronicling my family history? If you don’t, why not check it out at my website, listed under McGinty Chronicles. It’s set up a little confusingly, but fear not, I’ll get you through it. Click on my website and find McGinty Chronicles in the slide out menu on the left. Click on the main button and that will open the welcome page. After that, on the slide out menu, you can choose the JL Bio Page. After that the story begins with The Chronicles, but you’ll have to start with the very last entry on that page, which is really the first entry of the entire Chronicle. The rest of the chapters (Chronicles 2009, Hot Off The Presses and Out On A Limb) follow the same routine, reading from the bottom. Along with a interesting assembled story, there is documentation and family artifacts that date back as far as The Civil War. Why am I bringing this up, other than hoping new readers will enjoy it? Because I wanted to show off a recent asquisition. In a bittersweet moment, I came into possession of another family artifact. It was while we were in Illinois two weeks ago and my step-mother sent me home with what my father had always intended me to have. 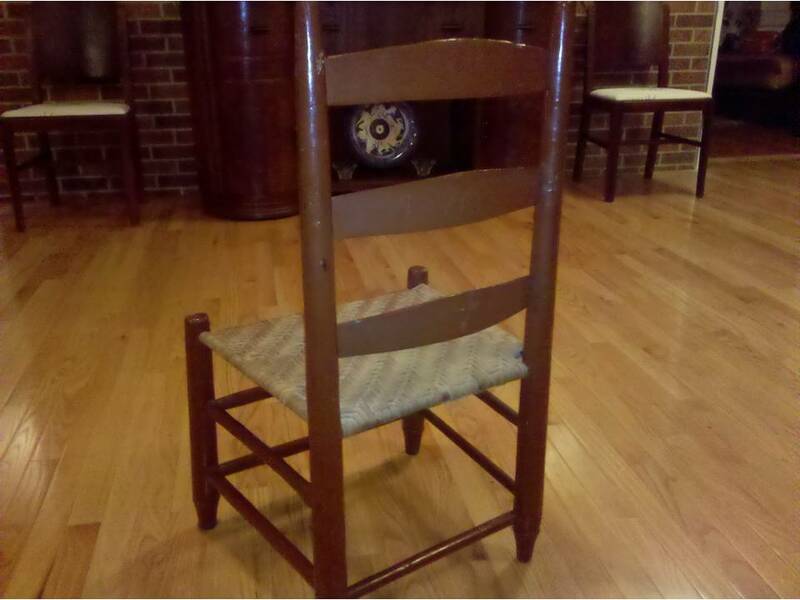 A chair. The chair. 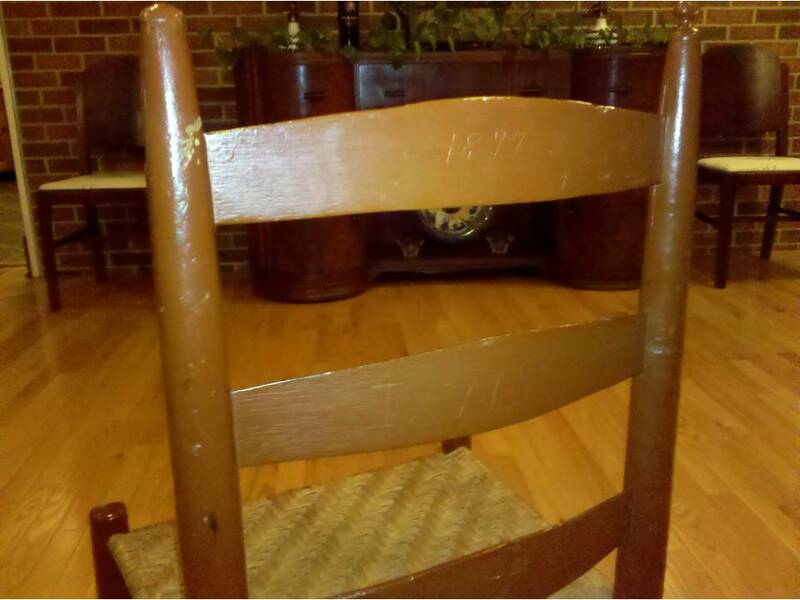 The chair that was made by Thomas Wyatt, my great-great grandfather, of the main players in McGinty Chronicles. As you can see in the last picture, on the top rung is the date 1877 and on the second rung, the initials T. W. S. One thing I’m not quite sure about is whether the caning is original, although judging by the condition of it, I would dare say it has been redone. 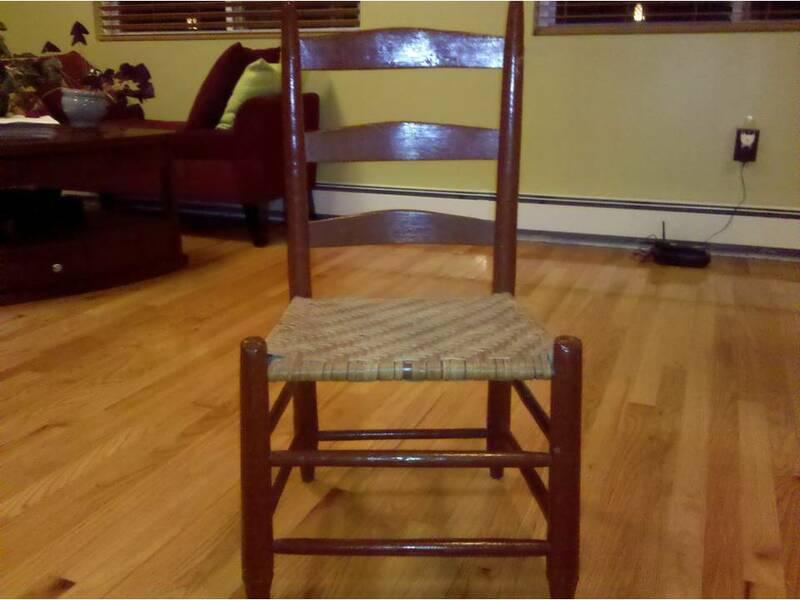 Plus, I also think at one point the chair was repainted and the wicker seems to cover the paint job. The seat, by the way, has a height of 14″. Evidence–the height of the chair and the size of his money belt, which seen in person is rather telltale–says he was a man of slight build. The future of the Chronicles? My intention is to continue them but with the unfortunate passing of another source of information, Aunt Georgie, much of a segment of a certain period in time will have to be cleverly pieced together with what information is already known. I just have to get to it and get it going.